Leading off this week, there are valuable lessons to be learned about James Dewar and the Thermos in this post from Agilent Technologies. Wanna see Virgin Atlantic’s newest plane being assembled in less than 3 minutes? Check out Manufacturer’s News’ retweet of AR Manufacturing’s time-lapse video post. We love when industries can poke a little fun at themselves and this post that O.C. White shared of Fake Science’s photo gave us a nice chuckle. Post by O.C. White Company. In one of those “I never thought about that” posts, Laughing Squid showed us Bandstand, which provides a visual illustration of where different bands position their members during a concert. There were many posts about one of last week’s top stories: Here’s Mashable’s take on the apparent bendability of the new Apple iPhone 6. And we close out this week’s column with our post about Steve Allen’s new Guest Blog about Sustainability. Save $73.55 off the MSRP on the 3M COMBOTESTER Combination Wrist Strap & Footwear Tester (Q Source SKU: S036-000460) when you use our FPF092614 Coupon Code. This Featured Product Friday (FPF) promo is valid from today, September 26, 2014 through Sunday, September 28, 2014. This portable, stand-alone 3M COMBOTESTER tests wrist straps, heel grounders, and ESD shoes for proper resistance and indicates the results with a red-, green-, or yellow-colored light. Regularly listed at $438.55, but with our FPF code savings you’ll get it for just $365.00. While this is a 3-day limited-time price, the coupon is unlimited. Use the code as many times as you like while it is valid—and please feel free to share the code with your friends, colleagues, and via social media. Steve Allen, from ACL, is back with a look at the concept of sustainability and what companies like ACL need to do to achieve it. Sustainability is a multi-faceted concern for chemical manufacturers. Chemical companies have a responsibility to future generations to implement sustainable methods throughout operations. ACL Staticide is one chemical manufacturer who is making a concerted, strategic approach to the environment and sustainability. And, in today’s market, brand leaders must focus on continued sustainability. The simple definition that sustainability is something that improves the direct quality of human life within the carrying capacity of supporting eco-systems, though vague, conveys the idea of sustainability having quantifiable limits. But sustainability is also a call to action, a task in progress or even a “journey.” Some definitions set out common goals or values to achieve sustainability. The so called “Earth Charter” speaks of a sustainable global society founded on respect for nature and natural resources (like chemicals). Now this may be a bit out there, but conducting business and manufacturing in a way that leaves resources available, intact, and healthy for the next generation of business just makes good business acumen. Businesses, as ACL does, must make this a daily focus. More than that, sustainability implies responsible and proactive decision-making and innovation that minimizes negative impact and maintains balance between ecological resilience and chemical resource vitality. These actions are necessary to ensure a desirable planet for all—now and in the future. Some specific types of sustainability include sustainable agriculture, sustainable refining, sustainable processes, and sustainable resource development. In the chemical arena, the solution to sustainable innovation, development, and manufacturing may be summed up in these three key actions: reduce, reuse, and recycle wherever and whenever possible. ACL Staticide focuses on these every day in manufacturing processes, strategic distribution practices, turnkey outsource operations, and in the way fundamental business operations are run. Operational sustainability is important to all of us. In outsource operations, any off spec or returned material is evaluated immediately to determine its suitability to be reworked and recycled. 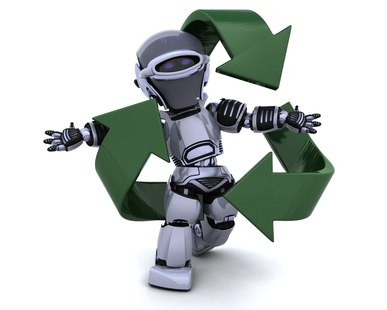 All material is tested prior to rework to avoid waste and to limit any impact on the environment. The lion’s share of packaging uses predominantly non-virgin recycled materials to limit the impact on environmental resources. In most operations, waste and cooling water is rigorously monitored and recycled throughout the processes. Many facilities conduct operations on a four, ten-hour day schedule to reduce energy costs and increase efficiencies. Similar products and chemistries have been consolidated to streamline product offerings, support customer needs, and reduce waste & chemical impact on the industry served. Additionally, 80/20 simplification and lean transformational operations management have been implemented in many cost- and labor-intensive production processes to drive out energy costs, reduce waste, and specifically reduce the carbon footprint. In 2014, ACL set the bar high with the introduction of a more ambitious, next-generation set of technologies and chemistries, focused on strengthening relationships within the communities, continuing to improve product stewardship and innovation to solve problems, and reducing emissions/carbon footprint. ACL believes that sustainability is based on a simple principle: Everything needed for our survival and well-being depends either directly or indirectly on our natural environment. Sustainability creates and maintains the conditions under which humans and nature can exist in productive harmony. Sustainability is important for making sure that we have and will continue to have the water, materials, and resources to grow our businesses and protect our environment. In summary, sustainability has emerged as a result of significant concerns about the unintended social, environmental, and economic consequences of rapid economic growth and consumption of natural resources. ACL Staticide continues to strive for the balance of maintaining & improving chemical sustainability and reducing the impact on the environment & available resources while continuing to produce innovative, relevant, and high-quality/performance products for industry. Q Source thanks Steve for another informative Guest Blog contribution to The Q Source Resource. For information about ACL Staticide and related products, please visit our ACL Staticide Department at QSource.com. You may also contact us via email or phone at 800-966-6020 and one of our associates will be happy to assist you. If there's a product or topic you'd like to see The Q Source Resource write about please let us know. We'd also appreciate if you share this blog post with your friends and colleagues via the social media links below. If you have questions or comments for Steve about sustainability please leave him a message in the comments section. Leading off this week, Workrite Ergonomics retweeted this post about a cool Star Wars inspired home. We’re wondering if it includes a Cantina-themed mini-bar. Robot Plaza shared this interesting post about robot bartenders. If they don’t have a belly button, can they still make you a Fuzzy Navel? On those long days at work it sometimes feels like you’re a hamster on a wheel. Laughing Squid’s post takes that a step further and shows you how to actually become one. Laboratory Equipment magazine posted an article about a new virus (Chikungunya) that is as scary to read about as it is to pronounce. Reading EE Times’ post about these 7 incredible Medtech predictions for the near future had us feeling hopeful and slightly in awe. And we close out this week’s column with our shared post of Instructables solution for getting your own Apple Watch before everyone else. 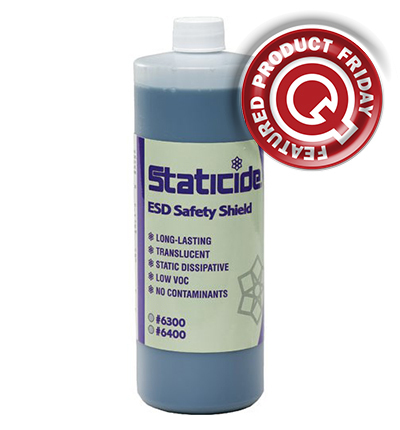 Get 25% off the MSRP on a quart of ACL Staticide’s 6300Q Staticide ESD Safety Shield Static-Dissipative Coating (Q Source SKU: A008-000122) when you use our FPF091914 Coupon Code. This Featured Product Friday (FPF) promo is valid from today, September 19, 2014 through Sunday, September 21, 2014. ACL Staticide’s Staticide ESD Safety Shield Static-Dissipative Coating is a simple-to-use protective coating solution for plastics. Made from blended durable polymer materials, the 6300Q solution provides dependable protection by allowing static to dissipate at a safe rate regardless of relative humidity. Regularly listed at $120.00, but with our FPF code savings you’ll get it for just $90.00. While this is a 3-day limited-time price, the coupon is unlimited. Use the code as many times as you like while it is valid—and please feel free to share the code with your friends, colleagues, and via social media. 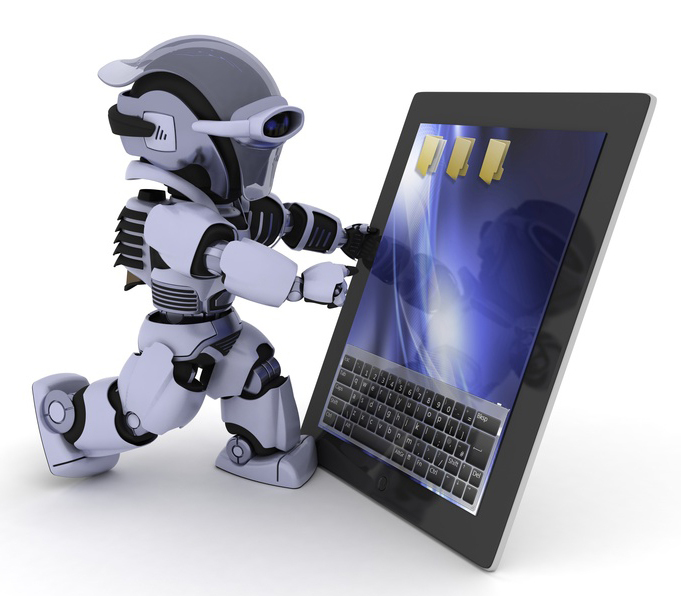 Leading off this week, TE Connectivity shared this post about robot butlers working at Starwood Hotels. How much do you a tip a robot? Just how much Internet connectivity do we need? Zebra Technologies shared this post about common items, like diapers and doorbells, which will soon be Internet trackable. From diapers to doorbells, these are 5 #IoT devices you should know about from @iamWire http://t.co/EDOQrv5QLs What's your favorite? There were many 9/11-related posts last Thursday, but this photo shared by Conductive Containers Inc. (CCI) pretty much says it all. Post by Conductive Containers, Inc. Remember when Legos were just primary-colored plastics blocks that you built stuff with? MAKE Magazine’s post looks at one artist who uses them as a printing tool. Some of the hype from Apple’s long-awaited keynote presentation (yes, the iPhone 6 and Apple Watch are finally on their way) has died down now. But if you missed the two-hour event, Mashable posted this video that shows you everything you need to know in 90 seconds. And we close out this week’s column with our post of a new Guest Blog by ACL Staticide’s Steve Allen. Learn about the strength of a cleaning solvent and Kauri-Butanol values. Due to our office being closed this weekend for a major systems upgrade, Q Source’s Featured Product Friday weekly promo is taking this week off. But we’ll be back next Friday with a brand new money-saving offer on a popular featured item. In the meantime, visit QSource.com to shop our regular low prices on more than 30,000 quality products from all the top brands. We offer excellent selection and savings on popular items like Andersen Hog Heaven Anti-Fatigue Mats (save up to 33% off), Bevco 7000 Series Chairs (check out our low-priced, large selection), Excelta Cutters (2- to 5-star quality to fit your exact needs), or Vision Engineering Mantis Stereo Microscopes (impressive savings on state-of-the-art visual inspection systems). 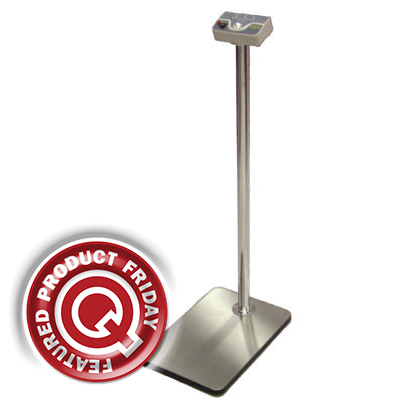 We’re nearing our 40th Featured Product Friday promo and we’d love your feedback. Have you purchased any of the featured items? What have you thought about the items featured and their promo prices? Do you have suggestions for future featured products? Please leave a comment or contact us with your input. Your feedback helps us serve you better and we very much appreciate your time. For further questions about Featured Product Friday, please read our informational blog post, call us (800-966-6020), or send us an email. To better serve you, our valued customers, the Q Source office will be closed on Friday, September 12, 2014, to perform a major software upgrade. This upgrade will give us the ability to serve you faster and more efficiently, provide you with more detailed product information, and allow us to create the best shopping environment possible. While we expect to be closed from around 3:00 p.m. (EST) on Thursday, September 11th, through Sunday, September 14th, our Web Site will remain available 24/7. Orders placed via QSource.com during our office closure will be processed as soon as possible upon re-opening. We are currently on target to be open for business as usual on Monday, September 15th. For further information and status updates, please stay tuned to our Q Source Resource Blog and our social media accounts. We thank you for your patience and look forward to serving you soon. When talking about the cleaning strength or aggressiveness of electronics cleaning solvents, we often refer to the solvent’s Kauri-Butanol number, or KB. The KB value is a test that measures the ability of a hydrocarbon solvent to overcome molecular binding forces in a standard solute. The KB test is one of a number of “cloud-point” determinations that can be used to measure and order solvents in a ranking based on relative solvent power. ACL Staticide uses this relative measure to determine and publish the general cleaning strengths of its broad range of electronics rework and repair products. Other cloud-point determinations are aniline cloud point, solubility grade, wax number, and heptane number. All have their specific uses, but the KB value is the most widely used test for gauging the relative solvent power of most hydrocarbon solvents. Though KB values can give misleading results for some solvents, the KB still proves useful when used to determine the relative solubility of different solvents. Kauri-Butanol value is only a small part of the subject of solubility, and there are many different solubility scales. How does KB actually work? 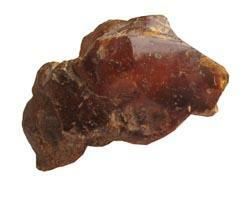 Kauri resin is a fossilized resin derived from the sap of the Kauri pine tree, which grows primarily in New Zealand. This resin dissolves easily in normal butyl alcohol (butanol) but will not dissolve very well in hydrocarbon solvents. To run the KB, one dissolves 20 grams of the Kauri resin in a fixed amount of n-butanol. This solution is then titrated with the hydrocarbon solvent to a “cloud point” or until the clear solution first turns slightly turbid or hazy. To make the cloud point easier to see, the test is usually performed over a page of ten-point type. When the ten-point type becomes slightly blurred or not quite crystal clear, you have reached the cloud point. The volume or number of milliliters of hydrocarbon solvent used to reach the cloud-point is reported as the Kauri-Butanol or KB value of the hydrocarbon solvent. By this methodology, the greater the volume of solvent needed to reach the cloud-point, the “stronger” the hydrocarbon solvent. A solvent with a KB value of 100 (ml) is a much stronger solvent than one with a KB value of 50. The Kauri–Butanol value definition is, according to the ASTM (method D 1133), the volume given in milliliters of any solvent with which at 25 °C (77 °F), a standard Kauri–Butanol solution is titrated and a certain amount of turbidity is detected. The accepted KB value range goes from 20 or 25, to 120 or 130. The KB values for ACL precision solvent cleaners, which are mixtures of various hydrocarbon solvents, are determined by running the Kauri-Butanol titration with the cleaner product. They can also be estimated using the KB value of the blended product from the KB values of its individual solvent components and their proportions in the solvent mixture. KB values for most of ACL’s solvent cleaners are found on the product’s technical data sheet. 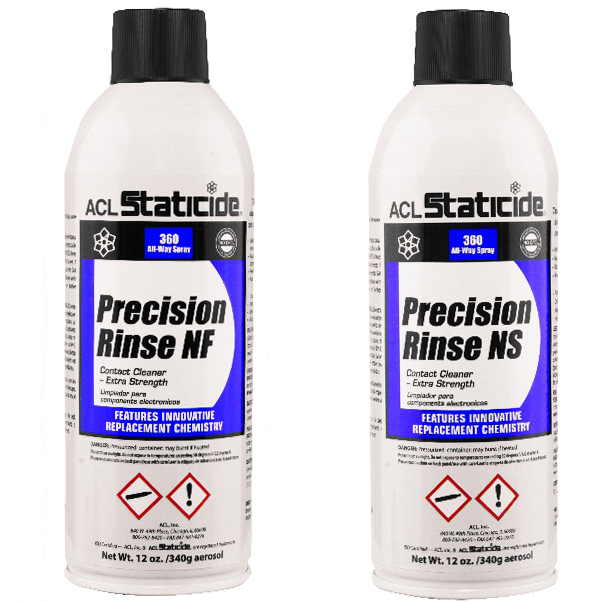 Most of the ACL solvent cleaner blends have KB values of 50 or less, but the stronger and more aggressive products like Precision Wash NF, or Precision Wash NS have KB values above 100. The higher the KB value of an ACL cleaner, the more likely it is that this product will attack soft plastics like polystyrene and polycarbonate. You would normally select an ACL cleaner with a high KB value only if you need heavy-duty cleaning of thick or encrusted residues and have no sensitive plastics in the application. If only light-duty cleaning or plastic safety is required, then the user should select an ACL cleaner that has a KB value of 50 or less. Even today, many people still misinterpret the KB value’s meaning. They relate the KB value with the titrating solvent “power.” As a matter of fact, there is no such thing as “solvent power.” Each solvent has its own capacity to dissolve a certain type of substance more or less effectively than others. This depends on its own physico-chemical properties, as well as those of the substance that has to be dissolved. In the beginning, the KB value was only used to evaluate the behavior of petroleum fractions. They would yield KB values of up to 30 or 35. Since this method was arbitrarily taken as a measure of the “solvent’s power,” very soon it was adopted to measure other type of solvents. For instance, chlorinated hydrocarbons, such as perchloroethylene, may be the most industry representative, legacy solvent used in our industry. It yields a KB value of about 90. With regard to chemicals and solubility, we are usually referring to dissolving a small amount of a liquid or solid, the solute, in a larger volume of liquid, called the solvent. When a liquid solvent dissolves a solute the molecules of the solvent break the electrostatic or binding forces that bind the molecules of the solute together. Solvent molecules force themselves between and around the solute molecules, until the molecules that made up the solute are finely dispersed within the larger volume of solvent molecules. There are some solvents such as alcohols, ketones, and glycol ethers that cannot be evaluated using the KB method, because they can readily dissolve the Kauri gum--so they can hardly form any turbidity when titrated into a Kauri–Butanol standard solution. In spite of the lack of strong and consistent theoretical test methods in our cleaning industry, the KB value has been accepted as a guide to determine the cleaning power of the solvents that are used in dry-cleaning machines (yes, dry cleaning). Indeed, there is a certain relation between the KB value of a solvent and its capacity to clean garments. Solvents with low KB values, lesser than 35, tend to dissolve greases somewhat easily. That is because the low KB value solvents can be relatively light fractions of petroleum which are similar in chemical nature to grease. These kinds of solvents tend to have some difficulties removing lacquer and varnish stains from garments. On the other hand, this family of solvents normally doesn’t damage the fabrics that are treated with them. As a case in point, Perchloroethylene with its aforementioned KB value of about 90. Not that this solvent is “stronger” than the hydrocarbons. It has simply different properties that allow an easier dissolution of substances such as varnishes and lacquers (and conformal coatings). This solvent can still dissolve greases and oils, but it begins damaging some synthetic garments over time. It may also provoke a certain degree of color bleeding. Perchloroethylene can dissolve most of the stains found in the garments while the potential damages that it can cause are still controllable. That is why “Perc” continues to be the leading solvent in the dry-cleaning industry. There are some other types of solvents, such as 1,1,1, trichloroethane, with a KB value of 124. This solvent has been found to be too aggressive for most of the natural and synthetic fabrics found in most garments today. That is why it hasn’t been successful in the electronics industry. However, with all this said, Kauri-Butanol values are not the final word in cleaning strength or solubility tests. In fact KB values tend to assign a higher solubility to a solvent than it really has. Also certain kinds of solvents cannot be tested with the Kauri-Butanol protocol as they prove to be infinitely soluble in this test procedure. For this reason ketones like acetone and MEK and glycol ethers cannot be tested by the Kauri-Butanol procedure to determine solvent solubility for these. As we can see, the Kauri–Butanol value can be useful to evaluate the proper solvent to be used for a given cleaning task. Those who have a variety of cleaning applications or multisolvent cleaning equipment (vapor degreasing, parts washers, and spray cabinets), can choose the kind of solvent that best serves the particular cleaning needs of their plant and application. The KB value is one of the parameters that have to be taken in account for that purpose. You can find all the necessary KB values for our solvents on ACL’s tech data sheets. For information about ACL Staticide products, please visit our ACL Staticide Department at QSource.com. You may also contact us via email or phone at 800-966-6020 and one of our associates will be happy to assist you. If there's a product or topic you'd like to see The Q Source Resource write about please let us know. We'd also appreciate if you share this blog post with your friends and colleagues via the social media links below. If you have questions or comments about cleaning solvent strengths and Kauri-Butanol values, please leave Steve Allen a message in the comments section. Leading off this week, TE Connectivity shared this piece about Google’s self-driving car. How do you think it will change the world? Is there anyone not listening to our cell phone calls?! Hakko’s post looks at mysterious fake cell phone towers being used around the U.S. to spy on nearby calls and text messages. NIST shared this Scientific American post about efforts to solve time travel’s “Grandfather Paradox.” Our question is, what did poor grandpa do that everyone wants to go back in time to kill him? MAKE Magazine’s post features an artist who puts his blood, sweat, and tears into his creations. Okay, well, at least his blood. Hey, we can see you all the way over there! EE Times’ post checks out the top 10 mega telescopes from now into the future. And we close out this week’s column with our email newsletter post about new Jensen Global dispensing products being added to QSource.com. 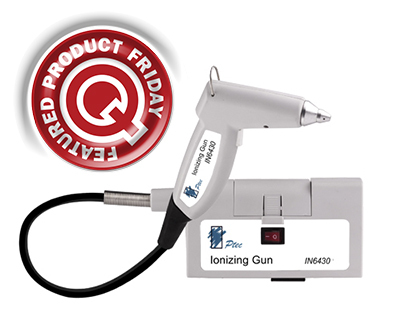 Save 14% off the MSRP on the Transforming Technologies IN6430 Ptec™ Ionizing Air Gun w/o Filter (Q Source SKU: T070-000053) when you use our FPF090514 Coupon Code. This Featured Product Friday (FPF) promo is valid from today, September 5, 2014 through Sunday, September 7, 2014. This Ptec Ionizing Air Gun was designed to protect static-sensitive devices while being easy to use and reliable. The IN6430 requires no calibration, uses High Frequency AC (68KHz) ion emission, and provides up to 75 psi air input. Regularly listed at $714.29, but with our FPF code savings you’ll get it for just $615.00. While this is a 3-day limited-time price, the coupon is unlimited. Use the code as many times as you like while it is valid—and please feel free to share the code with your friends, colleagues, and via social media. We couldn’t wait to share these cool pictures of Brady’s BMP21-Plus Portable Label Printer with you. So, as soon as we got our demo model, we snapped a bunch of shots and immediately put them on Flickr. Check out the new high-visibility yellow color, ABC keypad, and easy-to-read LCD display. Click on our latest Flickr photo set for an in-depth visual of this new handheld printer. To purchase the BMP21-Plus please visit QSource.com. Leading off this week, Workrite Ergonomics posted about this robotic suit that allows you to sit in mid-air while you work. We’re waiting for the one that lets you sleep while you work. Speaking of sleeping, the bed in this post by Laughing Squid asks the question: Do you want fries with that nap? Weller Soldering shared this MAKE Magazine post about the gift of a beautifully detailed 3D-printed prosthetic lower arm. Talk about lending a hand to your fellow man. Sometimes the old ways are still the better ways. This post by ThomasNet looks at studies that say a pen and paper beats a laptop for note-taking during meetings and lectures. Evil Mad Scientist’s post about the EggBot Pro leads us to believe that when the robots finally do take over, they will distract us with their exquisitely painted eggs. And we close out this week’s column with our post about Ergomat’s DuraStripe Floor Marking Solutions and their value for workplace safety and Lean applications.